Cytomax's patented alpha L-PolylactateTM buffers lactic acid production in your muscles, reducing the burn during intense training and minimizing post-exercise muscle soreness. Dudes, really? The ol' lactic acid myth was busted more than a decade ago. All we have to decide now is whether the Cytomax folks are 12 years behind on their science, or that they know better and are just too cynical to care. 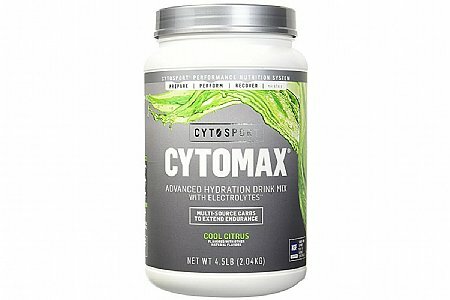 I have used Cytosport Cytomax during daily fitness rides for a few years. It taste great and provides a refreshing lift during the ride. I do wish Grape, my flavor of choice, were more easily available.